Zhou-era chariot The last stage of the Zhou Dynasty was called the Warring States Period. It was characterized by a state of near perpetual war between a half dozen warring states that vied for control of China. The war persisted for 500 years until the warring states collapsed and China was united under Emperor Qin in 221 B.C. The Warring States Period was marked by violence, political uncertainty, social upheaval, a lack of powerful central leaders and an intellectual rebellion among scribes and scholars that gave birth to a golden age of literature and poetry as well as philosophy. Great works of art from the Warring States Period include bronze vessels with inlaid geometric silver decorations, snake-shaped bronze fittings, jade and gold wire jewelry and bows made with dragons with glass eyeballs. Good Websites and Sources on Early Chinese History: 1) Robert Eno, Indiana University indiana.edu; 2) Chinese Text Project ctext.org ; 3) Visual Sourcebook of Chinese Civilization depts.washington.edu ; 4) Zhou Dynasty Wikipedia Wikipedia ; 5) Ancient China Life ancientchinalife.com ; 6) Ancient China for School Kids elibrary.sd71.bc.ca/subject_resources ; 7) Oriental Style ourorient.com ; Books: Cambridge History of Ancient China edited by Michael Loewe and Edward Shaughnessy (1999, Cambridge University Press); The Culture and Civilization of China, a massive, multi-volume series, (Yale University Press); Mysteries of Ancient China: New Discoveries from the Early Dynasties by Jessica Rawson (British Museum, 1996); “Early Chinese Religion” edited by John Lagerwey & Marc Kalinowski (Leiden: 2009); A fully annotated translation of the “Shiji” text appears in William Nienhauser, et al., The Grand Scribe’s Records (Bloomington), v. 1. The best concise narrative history of the Western Zhou is Edward Shaughnessy’s chapter, “Western Zhou History,” in Michael Loewe & Edward Shaughnessy, ed., The Cambridge History of Ancient China (Cambridge: 1999), 292-351. Eno divides the Warring State Perion into four narratives: Period I: Structures of Social Mobility 453-380 B.C. ; Period II: Reforms in Qin 360-338 B.C. ; Period III: The Horizontal and Vertical Alliances 320-256 B.C. ; Period IV: The Great Ministerial Lords of the Third Century 300-230 B.C. ; Epilogue: The Final Conquest of the Qin The birth of philosophical thought in China took place during a period when political and social structures that had been long established were subject to acute stress. No primary text provides the type of detailed narrative of Warring States political history that we find for the Spring and Autumn period in the Zuo zhuan. The closest comparable text is a book called the Zhanguo ce, or Intrigues of the Warring States, which consists largely of collected speeches of political advisors of the period, delivered to rulers in the context of policy discussion. This book was a major source for the historian Sima Qian as he prepared his “Shiji”. However, scholars now view the Zhanguo ce as a text composed less to record actual speeches that contained factual information than as a sort of textbook for aspiring courtiers, illustrating how to develop clever policy arguments so as to prevail in their court careers. This view of the text questions the historical reliability of its accounts. Beginning in the 8th century B.C. the authority of the emperors degenerated and hundreds of warlords fought among themselves until seven major kingdoms prevailed. This led to the formulation of the Eastern Zhou Dynasty (770-221 B.C.). The Spring and Autumn period (771-482 B.C. ), the Warring States period (481-221 B.C.) and the Age of Philosophers and the China’s Classical Age (6th century to 3rd century B.C.) 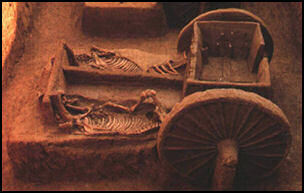 occurred within the Eastern Zhou Dynasty. Historian Francis Fukuyama of Johns Hopkins wrote: “As a result of the 500 years of intensive warfare that occurred during the Spring and Autumn and Warring States period (the eastern Zhou dynasty, 711-211 B.C. ), Chinese states formed and began to consolidate into a smaller number of larger polities. As a result of the desperate need to mobilize resources for war, they developed bureaucratic administrations that relied increasingly on impersonal administration rather than patrimonial recruitment that as typical of earlier periods of Chinese history." “The northern states learned the lessons of the period of Wu-Yue hegemony. The chariot was largely discarded, and instead of concentrating on the size and training of their elite officer corps, patrician lords cultivated huge armies of peasant infantrymen. Confucius Confucius Confucianism and Taoism developed in a period of Chinese history from the sixth century to the third century B.C., described as "The Age of Philosophers," which in turn coincided with the Warring States Period. During the Age of Philosophers, theories about life and god were debated openly at the "Hundred Schools," and vagrant scholars went from town to town, like traveling salesmen, looking for supporters, opening up academies and schools, and using philosophy as a means of furthering their political ambitions. Chinese emperors employed court philosophers who sometimes competed in public debates and philosophy contests, similar to ones conducted by the ancient Greeks. The uncertainty of this period created a longing for a mythical period of peace and prosperity when it was said that people in China followed rules set by the ancestors and achieved a state of harmony and social stability. The Age of Philosophers ended when the city-states collapsed and China was reunited under Emperor Qin Shihuangdi. 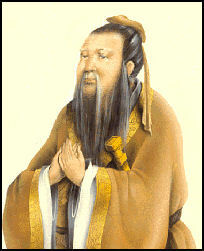 “About 500 B.C., Confucius and his disciples put their plan into action. It did not work. The outcome was that Confucius fled into exile and, for the next fifteen years, he wandered with many of his disciples from state to state in eastern China, looking for a ruler who would adopt his policies and employ him as minister. The search was fruitless, and about 485 B.C., one of his disciple-stewards in Lu, having made major contributions to his master in war, brokered an arrangement whereby Confucius was allowed to return to Lu and live in retirement as a teacher. Confucius died in Lu in 479 B.C. 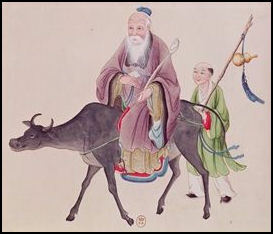 Taoism’s most famous work is the Daodejing, attributed to Laozi, who may have existed in the 6th century B.C. and is said to predate Confucius. It developed into an organized religion by the A.D. 2nd century. Although its practices vary widely, it generally advocates self-discipline and good living as a way to attain immortality, as well as elaborate rituals to purge individuals or communities of evil. Its ideas of harmony with nature underlie many aspects of Chinese culture, from calligraphy and painting to architecture and medicine. For generations, its formal teachings were passed down by Taoist priests as well as lay practitioners. Taoism is derived from the Chinese word Tao ("The Way"), which is pronounced "dao.” It is the second most important stream of Chinese thought after Confucianism. Like Confucianism it developed during the Zhou period. As is true with Confucianism, it isn't really a religion in the Western sense of the word. It is more of a mystical philosophy built on a set of ethical principals for everyday living. Unlike Confucianism, which is a practical philosophy with religious overtones, Taoism is more spiritual, rooted in magic and shamanism and concerned with things like self awareness, transcendentalism, and immortality. 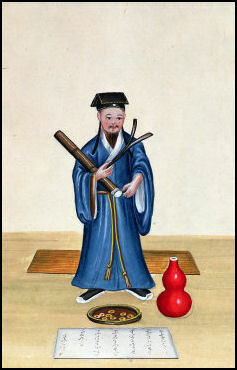 Taoism is regarded as the oldest of China's three religion-philosophies (Confucianism and Buddhism are the other two). 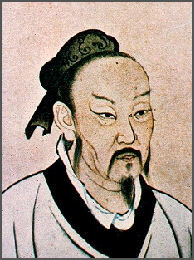 Like Confucianism it emerged during the Age of Philosophers and was given some structure by influential Taoist scholars such as the Taoist master Zhuangzi Chuang Tzu. Some historians have argued that Taoism it a revival of religious thought dominant in the Shang Dynasty (1558 to 1102 B.C.). Around the same time the Schools of Lao-tze and Zhuangzi were exploring similar ideas. Scholars there developed the theory of Tao: 1) that the fundamental basis of all beings is based on a state of non-being rather than being; 2) that it was possible to avoid death through uniting oneself with the universal nothingness of Tao; and 3) the best way to do this was to empty oneself of desires and live like a hermit.